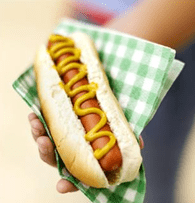 Don’t be a Weiner – Secure your Twitter Account! Ok fine, #Weinergate was fiction and no one ever actually hacked the perv’s twitter account. That said, if you don’t want to look like a Weiner, simply follow the steps in this groovyPost to add a layer of security between your Twitter account and the bad guys. Security is like an Ogre onion. It’s all about layers. In other words, there’s no single thing you can do to make your account 100% secure. That said, every layer of security you add makes it that much more difficult to compromise your online accounts. So, starting with the first layer, let’s create a unique, strong password. 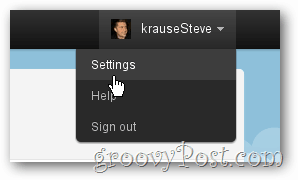 Logon to Twitter and Click your Account Name on the top right of the browser and Click Settings. A strong password is a unique password. As tempting as it might be, never use the same password on multiple websites. Sharing passwords between sites is like Russian Roulette. All it takes is one website hack to really really ruin your day. Add a layer of security to your online accounts buy using unique passwords. Don’t use dictionary words. Yeah I know, your kids are really cute but their names make horrible passwords as do months of the year. Dictionary words are easy to guess and there’s about a million apps out there which specialize in attacking accounts using dictionary words in all known languages. Use a passphrase. You mean like an actual phrase? Yes, that’s exactly what I mean! The great thing about a passphrase is it’s long, it’s not a dictionary word and in some cases it’s easy to include special characters. Unfortunately Twitter doesn’t allow spaces in their passwords however you can still use special characters like in my example: ilovegroovypostsoverymuch!! – Wow, a 27 character password which is easy to remember and includes 2 special characters. Good luck trying to hack a password like that one! Ready to choose a long-and-strong password? 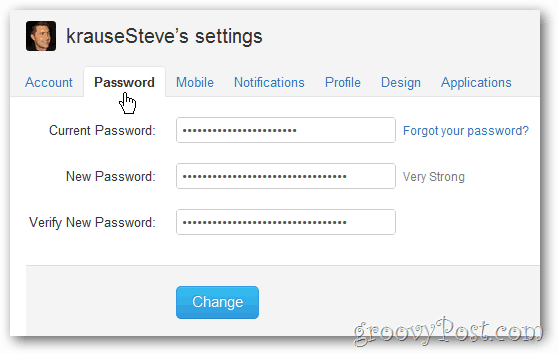 Click the Password Tab in Twitter, enter the new/old passwords and Click Change. As great as a strong password is, there are still ways for a really nasty bad guy to steal it. To guard against this, Twitter recently upgraded their system to allow users to encrypt all traffic between your web browser and twitter.com. Unfortunately this isn’t the default setting so let’s go enable it. From the Settings screen, Click the Account Tab. Now scroll down to the bottom and Check the box Always use HTTPS. Browser plugins exist which force HTTPS sessions if the website supports it. That being said, if the website (like twitter and facebook) allows you to force HTTPS, do it. Another option is encrypting your session entirely using a VPN client on your mobile or PC. Overall, the more layers of security the better. Although I focused on Twitter in this groovyPost, these recommendations are valid for pretty much any online service. In the end, it’s all about being educated and then doing something with that knowledge. If you learned something today, please share this groovyPost someone you think could benefit from it. And if you think I missed a security tip, please drop it below so I can incorporate it into the groovyPost! Two people I know with Twitter accounts got hacked last week. Will be tweeting this article :-) Re. my own account I also revoked access to a few third party apps. Ah…. that’s another good tip Sue. I should have included a sweep of all 3rd party apps. Will update the article. done and done. I also went and installed that chrome extension that always enabled encryption on all sites. Nice find on that one.